When I’m at work at the beautiful Weaving Shop at the Norwegian Folk Museum there’s always a lot that needs to be done. Visitors might come to see the looms, to teach their children how to work the knitting nancy, or to see how to do tablet weaving. The shop needs to be clean and tidy, packages need to be packed, techniques to me demonstrated and the right yarn to be found for every and any project. Therefore it is important that the handicraft I’m doing in the quieter moments can be use both to demonstrate materials, tools and techniques, while they should be easy to put aside. Circle scarves are perfect for this. They are pretty, can be varied almost endlessly, while one has to keep a hold of little else than the basic technique while making them. 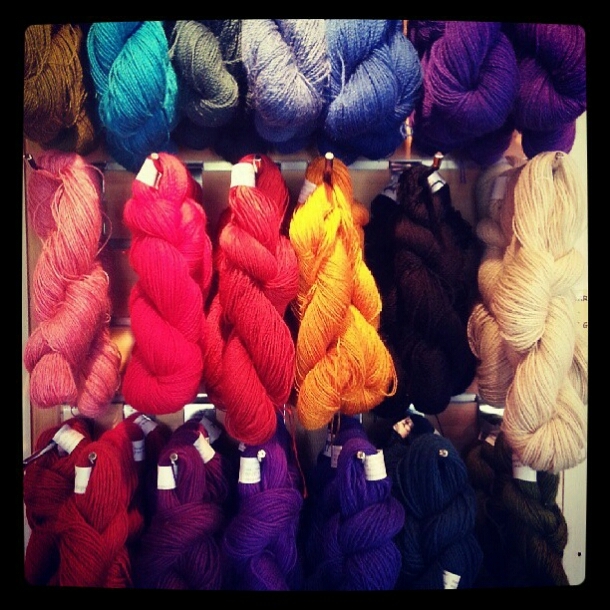 From behind the desk I look straight at the wall with all the lovely yarns from the micro spinnery of Telespinn, and I gotta tell you – I am hooked! The colors almost call out to me to be knitted into certain patterns and it is such fun to play and experiment with them. So this week I finished yet another one: the faboulous reversible spiral winter wonder circle scarf, which I knit in uncolored Mari yarn. Cast on 100 stitches in Mari yarn on a 40cm cable size 4.5. 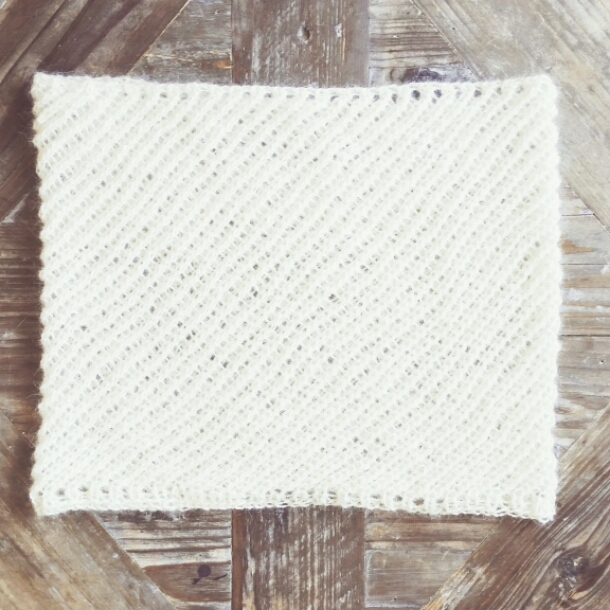 Rib for two rounds (knit 1, purl 1). 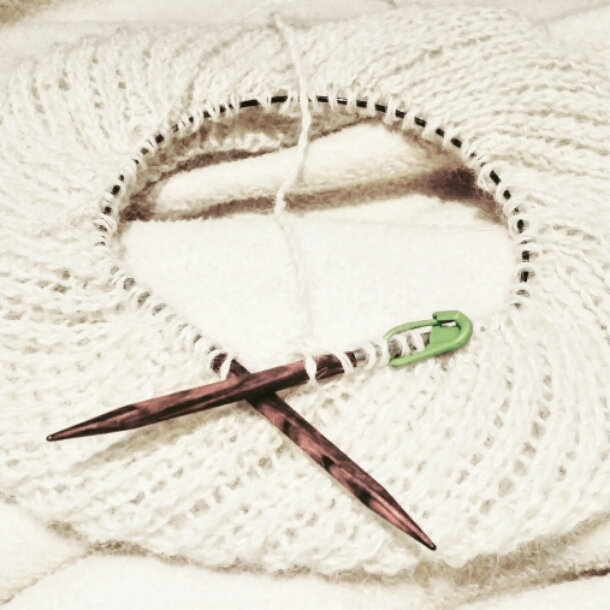 Continue afterwards with *1 yarn over, knit 2 together* repeat until you have about 6 meters of yarn left. Jepp, that’s it. Pay close attention not to skip any stitches though. The pattern moves sideways all on its own. To finish rib for two more rounds, and cast off losely. Remember to wash and dampen your item in the end, and to strech it gently into shape while stile wet. 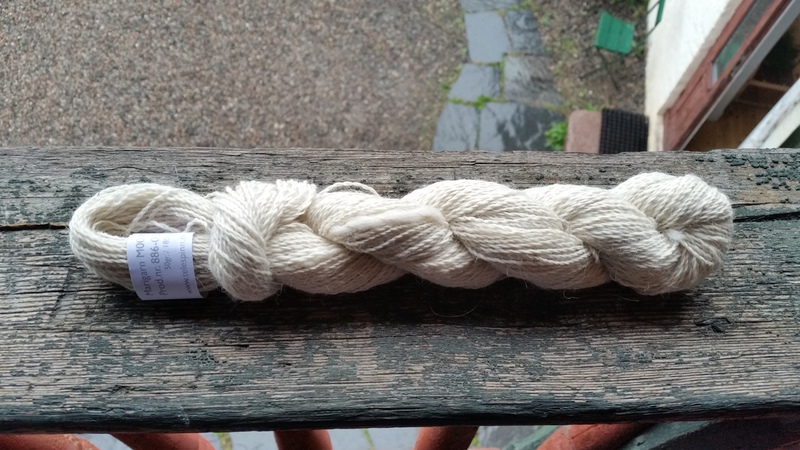 The yarn from Telespinn isn’t washed after spinning and will only get its final softness and color after being washed. Handwash at 30 degrees. The finished item can be bought at my etsy store PolkadotViking.